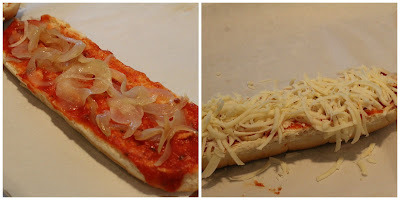 Today, we are celebrating pizza, and I thought I would share my very favorite pizza item, the Pizza Steak Hoagie. Growing up, the pizza steak hoagies that I loved were made with cube steak slices that were pounded down and tenderized. I thought I would change that up by using filet mignon for a taste that simply melts in your mouth. Trim the fat edges off of the steak. Cut the steak across the thickness of the steak. Use a meat mallet to pound down in to thin slices. Cut off any large fat pieces you may have missed. Slice onion in to thin slices. Cook the fat in a frying pan. Remove the fat pieces, but leave the juice from the fat. In a separate pan, saute the onions in a pat of butter. Pan fry the steaks, to medium rare, in the pan where you cooked the fat. Spread the pizza sauce on to the bread. Add the sauteed onions to the bottom piece and the cheese to the top piece. Place under broiler until onions are hot and cheese is melted. Place meat on top of onions. Enjoy your Pizza Steak Hoagie! Thank you for joining me today and Thank you to Coleen from The Redhead Baker for being our host for this fun and tasty event! Here is what the rest of the #SundaySupper family created for today! What a blast from the past!!!! My Dad used to make these all the time. I had forgotten about them - I'll have to send this to him. Sounds delicious Teri! I'm there! I think I know what we're having for dinner! I used to have pizza steak with my ex BF in college and haven't had one since. They're so good! Definitely making these soon. Your Pizza Steak Hoagie is perfect for Sunday Supper! Hope you are having a wonderful week and thanks so much for sharing with Full Plate Thursday. A Giveaway You Won't Want to Miss! Fall Food Ideas You Won't Want to Miss!